Today is the last day of the 2010 Computational Management Science (CMS) conference that is taking place in Vienna, Austria. The weather is now cool and rainy but it should be clearing up later today. It has been absolutely wonderful to listen to talks on topics ranging from the design of transportation networks for hazardous material shipments, to the analysis of earmarks and financing in humanitarian operations to the formulation of teams and resource allocation. I have been going to the supply chain, transportation, and networks stream of talks and also to several of the game theory and stochastic programming ones. Many of the participants have told me that they will be coming back to future CMS conferences since they have learned so much from this conference and have also had a wonderful time socially. The next CMS conference will take place in Spring 2011 in Neuchatel, Switzerland. Today I will be attending another plenary lecture (the final one and the closing session of this conference) which will be delivered by Dr. Claudia Sagastizabal who is Argentinian but works in Rio de Janeiro, Brazil. I commend the organizers for having two female plenary speakers (out of four)! My plenary talk, Supply Chain Networks: Challenges and Opportunities from Analysis to Design, can be accessed, in pdf format here. Given the number of positive comments that I have received from audience members, I believe that I got the importance of this topic and the fascinating applications across. Plenary talks play a very important role at scientific conferences. I have already extended my congratulations to the other plenary speakers -- Professor Campi of the University of Brescia in Italy and Professor Pistikopoulos of Imperial College in London. The content of their talks as well as their delivery of them were fabulous. I am getting intellectually spoiled here by the originality of and creativity behind the research presented. The organizers have done a magnificent job of getting this conference together and I thank them as well. My flight from Logan Airport in Boston to Frankfurt via Lufthansa was wonderful except that there was a dog underneath my seat named Bailey, who is a shitzu, and who whined painfully for hours. Some of us thought that the plane was experiencing mechanical difficulties. As I wrote back in May on this blog, on my flight back from Honolulu, there was a cat next to me that a serviceman had brought on board. Bailey's owner said that it was his third trip to Germany and, for some reason, he could not settle down. I managed to converse a bit with my seatmate and read the NYTimes but then decided that with the conference and my speaking engagements in Europe I had better get some sleep. Luckily, a stewardess found me another aisle seat so that I could catch some shuteye. My new seatmate was a postdoc from Germany, who is Italian, and who was returning from a Gordon conference in New Hampshire so we ended up having a delightful conversation about scientific research and even the World Cup and we even managed to get some sleep. The Lufthansa plane had terrific and very comfortable seats and the bathrooms (first time I had seen this) were in the middle of the plane and a staircase down (lots of legroom there). After a brief layover at the Frankfurt airport I caught my Austrian Airways flight to Vienna. Yesterday was the first day of the Computational Management Science conference which is taking place in glorious Vienna, Austria. The weather here is sunny and cool with gentle breezes -- simply perfect and a very welcome break from the heat back in the US. Yesterday I gave the opening keynote talk on supply chains networks and had a chance to speak at another session that I had organized. In the latter, one of my former doctoral students, Professor Tina Wakolbinger also spoke, and it is always extra special to see former students doing so well. In addition, a group of us, including colleagues from Texas and Florida, went out to lunch together. Last evening a group of us was invited to Professor Georg Pflug's home in Vienna for a lavish dinner buffet. Professor Pflug is the organizer of this conference. It was the perfect evening with colleagues from around the world conversing and dining in an elegant setting. It will be hard to leave this magnificent city! Of course, I already also managed to indulge in some delicious Mozart kugel chocolates. I will soon be on a two week trip to Europe to speak at conferences and have begun to pack. Packing a suitcase is an optimization problem to which we can apply the tools of operations research. I am assuming one carryon suitcase which must fit into the overhead compartment in the airplane(s) so I have to deal with a limited volume. I am also limited as to the weight of the fully packed suitcase since I insist on carrying my suitcase on the plane and having it with me in my travels. (I recall not so fondly having to dump some of my favorite shoes at the Auckland airport since I was over the weight limit and refuse, if at all possible, to check my luggage, since my suitcase from Japan, lost two decades ago, compliments of United, has yet to arrive.) Also, every academic has his share of horror stories of suitcases that arrived at the destination after the talks were given. One should pack for the weather (so I have been checking the weather forecasts for my two destinations) and for the occasion. I have to give two plenary talks so I have to look professional for the duration of the two conferences (besides my European mother instilled this in me and even as a child she dressed me in suits). In Vienna, the temps are forecasted to be rainy and cooler next week whereas Yalta is a summer tourist destination on the Black Sea and can be quite warm (but probably cooler than in the steamy Northeast of the US now). Of course (I wonder whether male academics care about this), I believe that the clothing that one takes should be color-coordinated and in good taste (and one should not wear the same outfit every day). Plus, with the right combination of skirts, tops, and accessories (shoes matter, too), one can maximize the number of outfits that one can generate. One has to factor in those evening banquets and conference excursions. Going for this period of time, one needs to also plan for including some exercise, so I will make do with a good pair of sneakers and some colorful t-shirts and shorts. Luckily, conferences in the summer only require lighter-weight clothing! So, I need to identify which resources (pieces of clothing) I should take with me in the carryon suitcase so that they do not exceed the volume of the suitcase nor the weight limit and maximize some representation of the utility or satisfaction that I get from bringing and wearing them. Additional constraints include "matching" type of constraints -- I can't very well just show up in only tops or only bottoms but need each day a complete outfit when I venture out. One of my most challenging extended business trips took place a few years ago when I had to speak in Cyprus (where it was very hot), then fly to Iceland for a conference (with temps in the mid40s), and then back to give a talk in Erice, Sicily, where it was also very warm. Luckily, my husband and daughter met me in Iceland and brought warm clothing so I did not have to deal with that part. I emailed my presentations to the organizers of the two conferences so I don't have to lug a laptop but have backups on a pendrive. I solved the above optimization problem and am delighted with the result. I could include a photo of my suitcase contents but, instead, I will surprise you with photos after this trip. And, remember to always take an umbrella! Supernetworks are big in China and two of my collaborators, Professor June Dong and Professor Patrick Qiang, are now in Shanghai discussing the formation of a sister Supernetworks Center to the Virtual Center for Supernetworks that I direct. 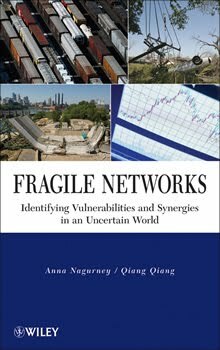 With June Dong I wrote the 2002 book, "Supernetworks: Decision-Making for the Informatiom Age," and last year Patrick Qiang and I co-authored the "Fragile Networks" book. 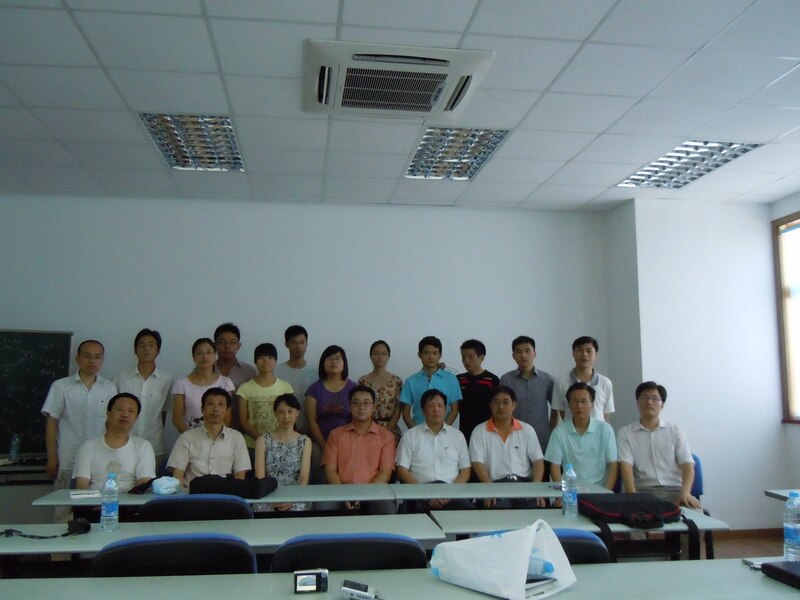 My last trip to China was back in 2006 when I spoke at the Fudan Management Science Forum in Shanghai on Supernetworks: Management Science for the 21st Century. 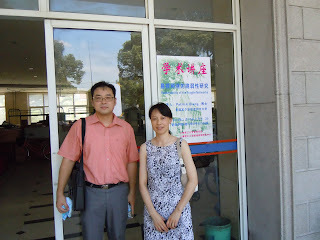 I also served on the Fudan Management Science Prize committee. It was a terrific conference and trip, especially since June Dong was also there and she is a former native of Shanghai, China. Such well-known researchers as Mike Pinedo, Charles Corbett, and Eitan Zemel were also there. I took tons of photos. 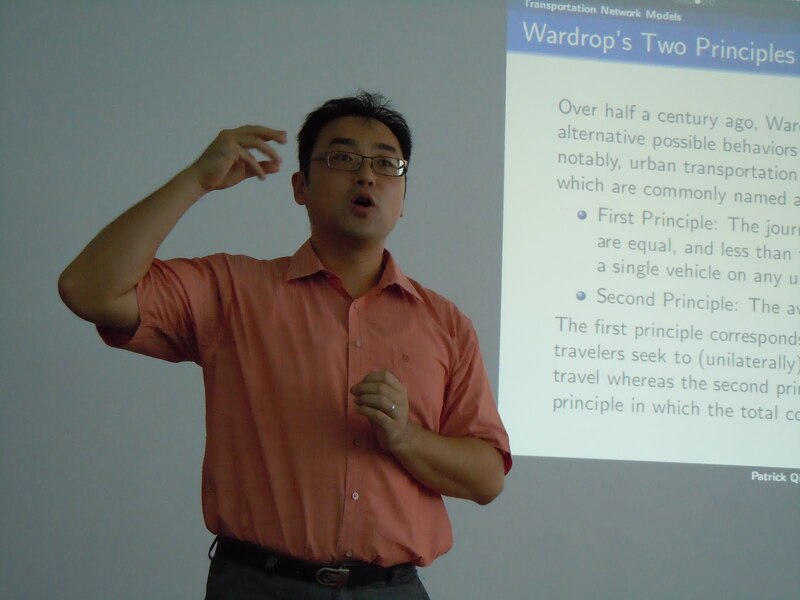 Patrick Qiang recently gave a presentation, "Vulnerability of Fragile Networks," at the School of Management at the Shanghai University for Science and Technology and was hosted by June. 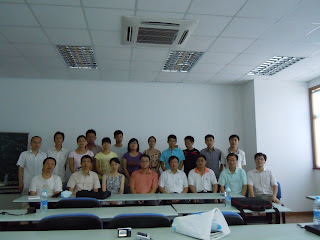 Above are photos taken at his presentation, with his host, a group photo with the audience, and an announcement on the university home page, which a student of mine, helped to translate. The audience for Patrick's talk even included students of Professor Daoli Zhu, who received the Fudan Management Science prize in 2006. Yesterday, I met with a group of my doctoral students at the Isenberg School of Management. I wanted to make sure that I gave them proper directions on their research while I was away at conferences in Europe. As I came up to my office there was a student, who had recently defended his PhD dissertation successfully, and wanted to say good-bye to me. He greeted me with a beautiful bouquet of flowers in appreciation (featured above). I was very touched that he would take the time to do this and to leave a "last" lasting impression. Now, as a "Dr." he will, in a few days, be starting his excellent position in statistical and economic consulting with a major consulting firm in Washington DC. Although I was not on his dissertation committee, as Area Coordinator of the Management Science track of our PhD program, I spend a lot of time helping to recruit doctoral students, who come from around the world, and in making sure that they are comfortable and succeed upon matriculation. This latest successful PhD to graduate from our program is from Europe. He finished his PhD in 4 years, despite the untimely death of his original dissertation advisor last December. In his most recent email message to me, he said: Thank you for all your support throughout my doctoral studies. If not our phone interview and your invaluable guidance four years ago, I don't think I would be in the program at all. Thank you! Wouldn't the world be a better place, if people took the time to say hello to their colleagues and co-workers, if bosses treated their employees with respect and kindness, and if we all supported one another and celebrated the successes of our students, staff, faculty, and even administrators?! Manners go a long way and kind words can make any day, even a difficult one, truly special. The above student will continue to succeed because of his thoughtfulness and courtesy. The circle of academic life is very special. As a community, though, we need to regularly celebrate the achievements and milestones of all involved and, at the very least, to extend our congratulations to students who get into our programs, who make good progress, sometimes, under challenging circumstances, and who, ultimately, earn their degrees and get terrific jobs. I just completed listening to the INFORMS podcast interview with Admiral Mike Mullen, the Chairman of the Joint Chiefs of Staff. He holds a Masters degree from the Naval Postgraduate School in Monterrey, California. It is a fantastic interview, conducted by Barry List, the Communications Director of INFORMS, and Peter Horner, the Editor of ORMS Today. In the interview, Admiral Mullen discusses the critical importance of operations research (O.R.) in military applications and how the needs for O.R. have changed over the past two decades. He talked about the issues of resources and constraints and the importance of optimization and systems thinking and even discussed linear and nonlinear programming. I was really pleased to hear his ideas on logistics and supply chains and how important optimization is also in business, which was gratifying coming from a top military leader. In addition, his points about military assistance in disasters were extremely relevant and lessons learned from Haiti. He spoke of constraints, resources, and flows. He also emphasized the importance of systems thinking and how O.R. helps with framing problems, which is very useful. He also emphasized how economic and business strength affects security. He asked: "How do I optimize flowing the right information at the right time to those in the field and during warfare?" You can listen to the interview in podcast form here. This interview should not be missed! Three Women Write a Book on Environmental Networks -- Was it Too Early? In 1999, two of my former doctoral students, Kanwalroop "Kathy" Dhanda and Padma Ramanujam, both of whom were from India, and I had our book, "Environmental Networks: A Framework for Economic Decision-Making and Policy Analysis," published by Edward Elgar Publishing in the series: New Horizons in Environmental Economics. The book was based on years of our research and publications that we had authored and co-authored that had appeared in such top journals as: Operations Research, Transportation Science, Networks, the Journal of Regional Science, and Energy Economics, among others. I always wondered, how many books, even of a nontechnical nature, have been published with three (or more) females as co-authors? Now, with parts of the world reporting record-breaking summer heat and Congress mired in inertia regarding the passage of a major climate bill, as David Leonhardt writes in The New York Times, I thought it important to bring this book to the renewed attention of policy makers. The book describes rigorous tools for the determination of pollution permits and taxes, and associated environmental emissions, from both stationary sources, such as firms, as well as from moving sources of pollution, such as vehicles. Padma's doctoral dissertation was on the latter topic and it was awarded the 1999 Transportation Science Section of INFORMS dissertation prize. The Harvard economist, Richard Stavins, whose work we cited in our book, told Leonhardt recently that he would actually prefer a bill that cut emissions less in the short term but created a template for much bigger cuts in the future. Success, to me, would be the beginning of political acceptance of carbon pricing, he said. Leonhardt believes that: A utility-only cap, even a flawed one, really would represent a whole different kind of progress than a souped-up version of fuel economy rules. A cap — any decent cap — remains the best benchmark of success. Interestingly, the doctoral dissertation of my most recent PhD student to graduate, Dr. Trisha Woolley, entitled: "Sustainable Supply Chains: Multicriteria Decision-Making and Policy Analysis for the Environment," focuses on the electric power industry and utilities and considers both carbon taxes (either centralized or decentralized) as well as pollution permits. In the next few weeks, before the Senate breaks for its August recess, or in September, before the midterm election campaign takes over, major issues regarding the climate bill will be decided, we expect and hope. Rachel Carson with her book, "A Silent Spring," changed the world. It is time for another book to do the same and break the legislators out of their inertia. And yes, women do write "Big Ideas" books, something that Germaine Greer has even been emphasizing although, ironically, some of these books may be rather mathematical and scientific! I have just about finished reading Henry Petroski's book, "The Essential Engineer," which was published in 2010. It is filled with excellent ideas about why engineering is different from science and how science and engineering and their practitioners and innovators must work together to address the grand challenges today from renewable energy to reducing vulnerability and even to securing cyberspace. Henry Petroski is a professor of civil engineering and history at Duke University. Coincidentally, in today's New York Times, there is an article by William Broad, "Taking Lessons from What Went Wrong," which begins with the eye-catching sentence: Disasters teach more than successes, with the overall thesis that disasters can spur innovation. The article includes an interview with Petroski and a graphic photo of the BP oil rig disaster. Technological feats that define the modern world are sometimes the result of events that some might wish to forget, from the collapse of the Tacoma-Narrows bridge in 1940 due to winds (with no lives lost), to the collapse of the Minneapolis bridge in 2007 (with 13 lives lost), to the sinking of the Titanic on its maiden voyage (with over 1,500 deaths, some due to hypothermia), and even the World Trade Center disaster (with approximately 3,000 deaths). Now we are all reeling from the BP oil rig disaster with ups and downs on almost a daily basis as to progress or lack thereof regarding the spill containment and the propagation of the massive effects on the environment and affected economic sectors and regions. I had written earlier on this blog about forensic accounting and we had even hosted Dr. Brian Levine who spoke on his research on the forensic investigation of the Internet and mobile devices. Our modern era demands a new area of expertise -- that of forensic engineering, which should clearly have risk management and policy analysis as essential constructs to assist in lessons learned (so mistakes do not get repeated in the future). Interestingly, Petroski uses as vivid examples in both of his two books noted above the challenges of engineering design in the context of bridge design. He considers bridge designers as very creative individuals who develop mental constructs of a bridge, combined with aesthetics, and then design mathematically the functional structure, which, I might add, should last for many years and support the weight of numerous vehicles. My uncle, Stanley Jarosz, is an award-winning bridge designer, who, although he is almost 92 years old, still works several days a week at an engineering firm. He is one of my greatest inspirations and an exceptional role model and gentleman (who, I might add, is also a big opera aficionado). I had the pleasure recently of seeing my uncle and my terrific cousin, Andrew (who, I might add, is a fellow Brown University grad), in NYC. I discussed Petroski's "The Essential Engineer" with my uncle and noted Petroski's almost mystic adulation of bridge designers. Solving the grand challenges faced by our civilization will require the cooperation and the working together of our best, creative minds, as well as capturing, in a quantifiable and rigorous manner, the risk associated with the resulting innovations. There is a wonderful interview (but too short) by Ron Howard, the Director of the Academy Award winning movie, "A Beautiful Mind," with John F. Nash Jr., the 1994 Nobel laureate in Economic Sciences, in a trailer that accompanies the DVD of this movie. I had the pleasure of recently seeing both. As John Nash walks away at the end of the interview, bundled up in a warm overcoat and knit cap, he ruefully comments that he has lost so many years and he needs to get back to research since that is what matters. John Nash's contributions to game theory earned him the Nobel Prize. His work has influenced numerous disciplines, in addition to economics, notably, operations research and management science, political science, applied mathematics, and computer science. I cite Nash's classical (1950) and (1951) papers in many of my papers that deal with competition. For example, in a paper, "Supply Chain Network Design Under Profit Maximization and Oligopolistic Competition," which was published recently in the journal, Transportation Research E (2010), I devised a model in which firms seek to determine their optimal supply chain network designs in terms of manufacturing, storage, and shipment capacities, as well as product flows so as to maximize profits. The governing concept is that of a Nash - Cournot equilibrium. This model extends my earlier model in which a firm seeks to design (or redesign) its supply chain network so as to minimize its total costs associated with capacity enhancements (even from scratch) as well as the operational costs. In the latter, no competition was assumed. That study, "Optimal Supply Chain Network Design and Redesign at Minimal Total Cost with Demand Satisfaction," is in press in the International Journal of Production Economics. High tech companies, including Samsung, Hewlett Packard, and IBM, as well as apparel companies from Benetton to Zara well understand the competitive advantages of careful cost control in supply chains. In addition, more and more companies, including Frito-Lay, Tesco, P&G, and Colgate are being recognized for their supply chain performance. The analytical challenges of identifying not only the optimal capacities associated with various supply chain network activities, coupled with the optimal production quantities, storage volumes, as well as shipments are tremendous, since the possibilities of where to site manufacturing plants and distribution centers, for example, and at which capacities, may be great. Furthermore, the determination of the optimal supply chain network design (or redesign if a supply chain network already exists with some capacities) needs to be done in a rigorous manner that captures the system-wide nature of the problem. I've also recently made use of the Nash equilibrium concept in devising a model to capture the gains of possible mergers and acquisitions of firms which are competitors. That paper, "Formulation and Analysis of Horizontal Mergers Among Oligopolistic Firms with Insights into the Merger Paradox: A Supply Chain Network Perspective," is in press in the journal Computational Management Science. The algorithms that can be applied to determine the optimal designs of supply chain networks, operating either in a centralized manner or in a competitive, decentralized manner, are also reported in the above papers. I agree with Nash that it is imperative to carve out the necessary time to do research. The intellectual life of a university depends on the research of its faculty and the give and take with students through teaching and scholarship. I teach and conduct research at the Isenberg School of Management at UMass Amherst, which values interdisciplinarity. The academic departments at Isenberg clearly reflect this from my own department, Finance and Operations Management, to Resource Economics, Sport Management, and Hospitality and Tourism Management, plus even the more, shall I say, "classical" departments of Management, Marketing, and Accounting and Information Systems. My department, in the last two years, has recruited two new Assistant Professors, Dr. Ahmed Ghoniem and Dr. Senay Solak, from Virginia Tech and Georgia Tech, respectively. Their work has already earned not only accolades but grants: Dr. Ghoniem has received funding from the Qatar National Research Fund to study how to minimize air traffic congestion whereas Dr. Solak has received funding from NSF to conduct research on housing foreclosures and nonprofit organizations. Last year, we recruited the new Dean of the Isenberg School, Dr. Mark Fuller, whose appointment is also in my department (and, yes, I served on the search committees for all these hires, and chaired those of the two above). Also, based on a proposal for a cluster hire that I, with colleagues in Computer Science, Electrical and Computer Engineering, and even Communications, was involved in, we were able to recruit for a position in cyber security. Dr. Traci Hess and her husband, Dr. John Wells, both from Washington State University, will be joining my department this Fall as Associate Professors. My colleagues conduct research on hedge funds, serve on FDA panels on food safety and risk, explore issues of privacy and marketing, to highlight only a few, very cool research topics. My own research and passion is heavily focused on networks, especially on complex networks with applications as varied as supply chains, humanitarian logistics, financial networks, electric power generation, and transportation. My recent research has emphasized network design and fragility and vulnerability analysis with applications to critical needs and healthcare products from vaccines to medicines as well as sustainability. Being in a business school, one can conduct research on the latest topics and this brings an energy and enthusiasm to the classroom which are palpable. Being trained in operations research and management science (my advisor at Brown University, Dr. Stella Dafermos, was the only female at that time in Engineering and Applied Math) one has the skill set to address many important problems. Although campuses will be teaming with students, both new and experienced ones, come the Fall, during the summer, the faculty are getting prepared as they work on new breakthroughs, present their work at conferences around the globe, rework their course materials, and take the time to reflect. Soon I will be giving keynote talks in Europe -- at the Computational Management Science in Vienna, Austria and at the Yalta Optimization Conference -- Network Science in Ukraine. As I tell my students, research can really take you places and introduce you to fascinating people! Working at a university is a great privilege and responsibility and always filled with new challenges, opportunities, and, sometimes, even drama (I will write about the latter topic sometime in the future)! After the International Conference on Computational Management Science in Vienna, Austria, I will be off to give a keynote talk at the 3rd Yalta Optimization Conference, which will take place in Yalta, Ukraine, at the beginning of August. The theme of this year's Yalta conference is Network Science. Of course, this scientific conference should not be confused with the famous historic Yalta Conference of 1945! I am looking forward to seeing this very scenic location on the Black Sea and to practicing both my Ukrainian and Russian. Plus, it will be great to reconnect with wonderful colleagues and friends there and to listen to the talks. Special thanks to the organizers: Professors Butenko, Prokopyev, and Shylo, for letting me deliver the keynote talk with title and abstract below. Abstract: The growing number of disasters globally has dramatically demonstrated the dependence of our economies and societies on critical infrastructure networks. At the same time, the deterioration of the infrastructure from transportation and logistical networks to electric power networks due to inadequate maintenance and development as well as to climate change, has resulted in large societal and individual user costs. This talk will focus on recently introduced mathematically rigorous and computer-based tools for the assessment of network efficiency and robustness, along with vulnerability analysis. The analysis is done through the prism of distinct behavioral principles, coupled with the network topologies, the demand for resources, and the resulting flows and induced costs. The concepts will be illustrated in the context of congested transportation networks, supply chains under disruptions, financial networks, and dynamic networks such as the Internet and electric power networks. We will further explore the connections between transportation networks and different network systems and will quantify synergies associated with network integration, ranging from corporate mergers and acquisitions to collaboration among humanitarian organizations. I am very much looking forward to the International Conference on Computational Management Science that will take place in Vienna, Austria later this month. Vienna is a center of scholarship, culture, architecture, music, and intrigue. The last time that I was in Vienna was back in March 2009 when I spoke on Synergies and Vulnerabilities of Supply Chain Networks in a Global Economy at the Vienna University of Economics and Business Administration and was hosted by my esteemed and wonderful colleague there, Professor Manfred Fischer. At the Computational Management Science (CMS) 2010 conference, which will be at the University of Vienna, I will be giving a keynote / plenary talk, entitled, Supply Chain Networks: Challenges and Opportunities from Analysis to Design, and the abstract is below. Abstract: Supply chain networks provide the backbones for our economies since they involve the production, storage, and distribution of products as varied as vaccines and medicines, food, high tech products, automobiles, and even energy. Many of the supply chains today are global in nature and present challenging aspects for modeling and analysis. In this talk I will discuss different perspectives for supply chain modeling, analysis, and computation based on centralized vs. decentralized decision-making behavior, along with suitable methodological frameworks. I will also highlight applications to mergers and acquisitions and even humanitarian logistics through supply chain network integration. Such timely issues as risk management, demand uncertainty, outsourcing, and disruption management in the context of our recent research on supply chain network design and redesign will also be discussed. Suggestions for new directions and opportunities in healthcare and sustainable supply chain networks will conclude this talk. I thank the organizers of CMS 2010 for giving me the opportunity to deliver this talk. On June 11, 2010, the 2010 World Cup began and that was the same day that we mailed a postcard to ourselves from Buenos Aires, Argentina, where I spoke at the ALIO-INFORMS conference. Remember that today is July 12, 2010, the day after the ending of this World Cup in South Africa. I am pleased to report that the postcard that we sent to ourselves (since we love to track how long deliveries can take) arrived today! It took 1 month and 1 day and, strangely enough, it had a side trip to Mexico. Perhaps it was because Argentina beat Mexico in this World Cup?! 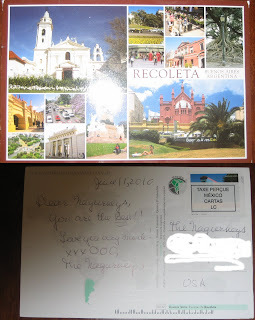 We started getting messages from relatives and friends in the past 10 days or so that our postcards to them from Buenos Aires were trickling in. I wish that there had been a GPS tracker on this card because I am sure that the journey that it took was fascinating from a transportation point of view. Above is what we are calling our infamous World Cup postcard. We whited out our address, which was present, so that was not the excuse for this extreme snail mail delivery. At least it did arrive, finally! Wherever you may have been this weekend, it was hard not to notice the excitement surrounding the 2010 World Cup final in South Africa. I was in cosmopolitan, gorgeous NYC this past weekend, which was filled not only with locals who weren't at the Hamptons, but also with many tourists from around the world. Yesterday, the scores during the Spain vs. The Netherlands final match were relayed from taxi driver to taxi driver (these we saw parked) and from tourist to tourist so one could always catch the score even while walking. As the German octopus named Paul "predicted," Spain beat The Netherlands and the final score was 1-0. Neither of these teams had ever advanced to the finals so it was a great achievement for both. The day before Germany beat Uruguay to receive third place in this 32 team World Cup. Thank you, South Africa, for a month of great sports in the form of the game of soccer that brought fans around the globe to focus on the exciting games in your country. It was the first time that the World Cup was hosted on the continent of Africa and South Africa should be congratulated for the success of this month-long sports event! Dr. James "Jim" Simons is an amazing man. He is a mathematician and a financier and the President of Renaissance Technologies, a well-known, very successful private investment firm and hedge fund. As the former chairperson of the Department of Mathematics at SUNY Stony Brook in the late 1960s to the mid-1970s, he built up this department to one of the top in the country. Since leaving SUNY Stony Brook, where his service and contributions were laudable enough, he and his wife have not stopped supporting that state university. His wife Marilyn, who has a PhD in economics from SUNY Stony Brook, has served since 1994 as President of the Simons Foundation, a charitable organization supporting researchers and institutions conducting advanced work in the basic sciences and mathematics, with a major emphasis on autism. In February 2008, the foundation gave $60 million to this state university, which is one of 64 institutions in this public university system. The press release can be read here. Interestingly, SUNY Stony Brook offered me a tenure-track Assistant Professorship in the Department of Applied Math and Statistics, after my interview there, while I was completing my PhD in Applied Math with a specialty in Operations Research at Brown University, but I declined. Our new Provost at UMass Amherst, Dr. James Staros, came from SUNY Stony Brook. James Simons is now one of the world's wealthiest men (see where knowing and loving mathematics can take you) and the Simons Center at SUNY Stony Brook carries his family's name. He is the son of a shoemaker from Massachusetts and received his degrees from MIT and UC Berkeley. The New York Times has an interesting and timely article on private donations to state universities. Today many state universities in the US are suffering from shortfalls of support from their respective states. Dr. Simons believes that donors do not want to support failing institutions and have their donations simply used as plugins and patchups for state funding gaps (or should I say, "gorges"). He is supporting/proposing different tuitions for individual state university institutions and this has resulted in some serious debates. You can read the article in the Times here. What Dr. Simons has done and continues to do in support of his State University, although he is not even an employee (nor a student there and not even an alum), is outstanding and laudatory. I wish that more would have his vision and his courage and that others would see and understand the essential role that public, in addition to private ones, universities play in our nation. I give annually to my state university and employer for a scholarship fund for students and the best thank you that I get is the excellence of our students and their joy in learning. One year ago, our book, Fragile Networks: Identifying Vulnerabilities and Synergies in an Uncertain World, was published and was recently noted by the Library Journal to be a top selling book in technology and engineering. 6 months ago, on January 12, 2010, a huge earthquake hit Haiti and awakened the world to the wrought devastation. I wrote regularly in this blog about the earthquake, the resulting human suffering and loss of lives, and the loss of critical infrastructure from the roads to telecommunications, plus hospitals and even schools, which only added to the suffering of the survivors. I also called for better coordination among the stakeholders and especially the humanitarian organizations for the provision of necessary supplies and decent logistics. Today, The New York Times has an OpEd piece written by my colleagues at Georgia Tech, which is right on target, and which speaks to one of the major themes of our Fragile Networks book: that the identification of the critical network links before (and after) their degradation and even ultimate devastation is essential. According to the OpEd piece, Haiti's External Weight, by Professors Desroches, Ergun, and Swann, 6 months after the earthquake: twenty million to 25 million cubic yards of debris fill the streets, yards, sidewalks and canals of Port-au-Prince — enough to fill five Louisiana Superdomes. Debris is one of the most significant issues keeping Haitians from rebuilding Port-au-Prince and resuming normal lives. Much of the stuff has been left in place or simply moved to the center or the sides of roads. Some streets with especially large piles of refuse are impassable. As a result, it can take hours to travel just a few miles. Meanwhile, schools, hospitals, businesses and homes remain blocked. Amazingly, only about 5% of the original debris has been properly disposed of and there are serious concerns about the ultimate impact of the debris on the environment, as well. Clearly, the efficiency and performance of the transportation and logistical networks in Haiti have been severely affected and degraded without a timely debris removal. Since such networks provide the infrastructure for the movement of people and goods, how can Haiti's economy and its citizens move forward?! In May, 2008, I had the privilege of convening a workshop: Humanitarian Logistics: Networks for Africa at the Rockefeller Foundation's Bellagio Center on Lake Como. It was apparent to us then, as it is now, that with the increasing number of disasters documented globally more attention to education, to research, and to policy analysis regarding humanitarian logistics and sustainable operations is sorely needed. Crises don't end once the media attention dissipates. I have been writing in this blog about our latest research on supply chain network design for critical needs products from vaccines to medicines and on hospital supply chains. I was delighted to read in the Boston Globe that Sanofi-Aventis, one of the world's largest drug makers, is expanding its operations in Massachusetts and that this will mean more jobs -- jobs of importance and meaning. According to the article: Sanofi-Aventis SA, is planning a $65 million expansion in Cambridge that will create about 300 jobs, making it the latest foreign pharmaceutical giant to invest in Massachusetts. The Paris-based drug maker is in the process of leasing space in Cambridgeport, where it will establish a joint headquarters for a new cancer division. As you may recall (what a feeling of deja vu) last summer, at this time, the world was battling the H1N1 virus from Argentina (coincidentally, my most recent international trip in the summer of 2010) to China to the United States. Sanofi-Aventis was one of only a handful of H1N1 vaccine producers and, given the low number of vaccine manufacturers, and the various challenges with the production of this vaccine, my research group began a study on multiproduct supply chain network design with applications to healthcare. Clearly, with fixed capacities, some of the vaccine producers had to switch from production of the annual flu vaccine to the challenging H1N1 vaccine. We are pleased that the study has resulted in a paper/report, "Multiproduct Supply Chain Network Design with Applications to Healthcare," which, given the timeliness of the topic, we are making available to our readers through the Virtual Center for Supernetworks. The research allows pharmaceutical firms to redesign their supply chains in an optimal way to enable the cost-minimizing production of multiple vaccines and medicines with demand satisfaction. Research at Business Schools is increasingly focusing not only on how wealth can be created but also how it can be done in a socially responsible way. Germany just lost to Spain with a brilliant goal header giving Spain a win with a score of 1-0. The final game will take place this Sunday in South Africa with The Netherlands playing Spain for the World Cup championship. This will be Spain's first World Cup final appearance. I studied both Spanish and German so did not favor either team. Amazing, though, to have 2 European soccer teams be the finalists of this great World Cup tournament in South Africa. The Netherlands Beats Uruguay in a Frenetic Finale! The Netherlands beat Uruguay with a score of 3-2 to advance to the finals of the 2010 World Cup. The game, as the announcer said, was "frenetic" and a heart-stopper. Now we have Germany vs. Spain tomorrow and then the winner of that game will play The Netherlands. Amazing to have a final of this World Cup of only European teams. To all of my colleagues and friends in The Netherlands, congratulations! The headers and athleticism of your soccer team have made your matches super exciting to watch at the 2010 World Cup in South Africa! History has already been made since no European team has ever won a World Cup outside of Europe! Although we are living in a world of "throwaways" we are seeing an exciting convergence of corporate social responsibility, green logistics, healthcare, and even humanitarian operations through the recycling, redesign, and reprocessing of medical products and associated medical waste, so there is HOPE! Interestingly, as The New York Times is reporting, in the article, "In a World of Throwaways, Making a Dent in Medical Waste," by Ingfei Chen, the biggest source of medical refuse is the operating room (O.R. ), with 20-30% of a hospital's waste. A nonprofit group in VA, Practice Greenhealth, is now working on reducing the environmental footprint of health care institutions with its Greening of the O.R. initiative, which is focusing on identifying the best sustainable practices for reducing operating room garbage, energy consumption, and indoor air quality problems, while lowering expenses and improving safety -- all fantastic goals! Reducing the waste associated with medical supplies and equipment,which can be achieved through recycling and reprocessing, for example, can save on new purchases and can also reduce landfill fees and incineration costs. For example, according to the article, the Hospital Corporation of America, which owns 163 hospitals, eliminated 94 tons of waste last year through the reprocessing of medical supplies! I am reminded of the similarity between medical waste and recycling and reprocessing issues to that of electronic recycling, or e-cycling, a topic that I have written about in the past, with Dr. Fuminori Toyasaki. Our paper, "Reverse Supply Chain Management and Electronic Waste Recycling: A Multitiered Network Equilibrium Framework for E-Cycling," remains as one of the top cited papers in Transportation Research E.
Dr. Ralph Pennino, the chief of plastic surgery at Rochester General Hospital in upstate New York, notes that surgeons have agreed to use standardized supply kits selected to cover most of their needs while leaving little unused, so that they can “work systems out so we don’t have anything to reprocess." This is said beautifully and speaks to the importance of designing health care supply chains and medical products accordingly, a topic that we have also been writing about, and where we specifically allow decision-makers to assign costs associated with oversupply/waste. Dr. Pennino notes that leftover items are donated to InterVol, a nonprofit organization started in 1989 by him. Each week, its volunteers gather about 8,000 pounds of unused supplies and reusable equipment from regional health care facilities, then ship the stock to clinics in more than two dozen countries, including Somalia and Haiti. This is an example of the best in green logistics, healthcare, and humanitarian operations! Do you know the value of the parts in your iPhone and what it took to put them all together? The way to calculate the various costs of the components plus the labor that is needed to manufacturer and assemble them so that consumers can acquire the latest hot product from Apple is to deconstruct the iPhone supply chain. At a cost of about $600, the iPhone 4, can be deconstructed by tracking its components from the dozen integrated chips and flash memory to the casings to the embedded GPS system. The hardware we can all see and these physical components contribute just under $200 to the price of the iPhone 4. According to an article in The New York Times, the smallest part of Apple’s costs are those in manufacturing and assembly, which takes place in China, right now in Shenzhen. The Chinese assembly-line workers put together the microchips, which come from Germany and Korea, a touch-screen module from Taiwan, even American-made chips that pull in Wi-Fi or cellphone signals, and more than 100 other components! This is truly a global supply chain with the greatest value to the product coming at the front-end and the back-end. In the iPhone 4, more than a dozen integrated circuit chips account for about two-thirds of the cost of producing a single device, according to iSuppli. However, soaring labor costs caused by worker shortages and unrest, a strengthening Chinese currency that makes exports more expensive, and other issues such as inflation and rising housing costs are all threatening to sharply increase the cost of making devices such as notebook computers, digital cameras and smartphones. Desperate factory owners in China are already shifting production away from this country’s dominant electronics manufacturing center in Shenzhen toward lower-cost regions, even in China’s mountainous interior. The world of contract manufacturers is invisible to consumers. According to The New York Times, it is a $250 billion industry, with only a few companies like Foxconn (which has been much in the news lately because of the worker strikes), Flextronics, and Jabil Circuit manufacturing and assembling for all the global electronics brands. These companies compete on price to earn small profit margins, analysts say. As we who work and conduct research in operations and supply chains know, such firms try to benefit from even minute operational changes to attain competitive advantage. For example, the Chinese companies have very low profit margins and increasingly the Chinese are not favoring low-end assembly work. At the same time, Foxconn is spending heavily on manufacturing many of the parts, molds and metals that are used in computers and handsets, even trying to find larger and cheaper sources of raw material and locating plants closer to mines with sources of necessary raw materials. So when you look at your smartphone, think about what went into your latest hightech gadget and favorite product, from the knowledge resources that helped to create its design, from the natural resources that enabled the construction of its components to the human resources that put the components together to the transportation services that delivered it to the stores. And remember, as you hold the product in your hands, which was made possible by the complex global supply chain that enabled its design, its manufacture, assembly, and distribution, the long journey that the product took to you. I am preparing my talks for the 2010 International Conference in Computational Management Science, which will take place in glorious Vienna, Austria, July 28-30, at the University of Vienna. I am very much looking forward to this conference. Besides giving the invited keynote talk, "Supply Chain Networks: Challenges and Opportunities from Analysis to Design," I will also be presenting, "Supply Chain Network Design for Critical Needs with Outsourcing," which is based on the paper forthcoming in the journal, Papers in Regional Science, with my doctoral student, Min Yu, and Professor Qiang "Patrick" Qiang of Pennsylvania State University in Malvern. Mr. Thomas Seyffertitiz of the Vienna University of Economics and Business (the largest business school in Europe) will be speaking on "Vulnerability and Disruption Analysis in Supply Chain Networks: A Layered Network Perspective;"
Professor Patrizia Daniele of the Department of Mathematics and Computer Science at the University of Catania in Italy will present: "Supply Chain Networks and Infinite Dimensional Duality Theory." The list of invited keynote speakers can be found here. The program with accepted talks and schedule can be downloaded here. There is nothing like a small town parade and today we enjoyed the 4th of July parade in Amherst, Massachusetts. The photos above were taken in downtown Amherst, where as the residents always say, only the "h" is silent. Tonight we are looking forward to the extravagant fireworks display which takes place annually. Rather than having 3 South American teams in the final four of the 2010 World Cup in South Africa, as many were predicting, we have 1 team from South America left, from Uruguay (who beat Ghana yesterday with penalty kicks), and three European teams: The Netherlands (who beat Brazil 2-1), Germany (who beat Argentina 4-0 today), and Spain (who beat Paraguay today 1-0). Next week, Uruguay will play against The Netherlands, and Spain will play against Germany. The New York Times had a wonderful article on Diego Maradona, the coach of the Argentinian team, which, I suspect, he may even have time now to read. I heard that his top player, Lionel Messi, was not feeling well on Thursday and missed practice (perhaps that affected his team's performance today). Congratulations to all the teams who played their hearts out at this World Cup. From my perspective as a spectator and a huge World Cup fan, they all deserve standing ovations. I caught the last half hour or so of the Brazil vs. The Netherlands World Cup soccer game and my heart is still beating fast. The goal scored by the Dutch team using three players' heads as though they were playing a volleyball game with their heads was breathtaking. For Holland to have beaten the number 1 ranked team, Brazil, at the 2010 World Cup speaks to the continuing drama and surprises taking place at this fascinating World Cup in South Africa. Thanks to Brazil and to its players, coaches, and fans for bringing their special skills in soccer to the world stage, despite the loss today. I hear from my academic colleagues in The Netherlands that the country is experiencing a very serious case of soccer frenzy, and justifiably so. I send my condolences to my colleagues in Brazil for their team's loss today which must be very painful since it was so unexpected. In an earlier blog post, I wrote about the speculation as to whether (or not) Grigoriy Perelman would accept the $1,000,000 math prize from the Clay Institute. According to the Clay Institute of Cambridge, Massachusetts (and this news was even reported in our local paper), Dr. Perelman, of St. Petersburg, Russia, has decided to decline the Millennium Prize for his contribution to solving the Poincare conjecture. The Institute President, Jim Carlson, was quoted as saying that Perelman's decision was not a complete surprise, since he had declined some previous math prizes. Dr. Perelman told Interfax that he considered his contribution to solving the Poincare conjecture no greater than that of the Columbia University mathematician, Richard Hamilton. In our local paper, the Daily Hampshire Gazette, it is stated that the Clay Institute officials will meet this Fall to decide what to do with the million dollars with Carlson saying,"We have some ideas in mind." "We want to consider that carefully and make the best use possible of the money for the benefit of mathematics." May I suggest that the money be used for scholarships and fellowships for deserving students and researchers in mathematics and associated technical subjects? The Pew Research Center has released another study through its Global Attitudes Project in conjunction with The International Herald Tribune, which is reported on in The New York Times, and which will surely generate provocative discussions. According to the study, which surveyed people in 22 different countries, people say that they firmly support equal rights for men and women, but many still believe that men should get preference when it comes to good jobs, higher education or even in some cases the simple right to work outside the home. The poll, conducted in April and May, suggests that in both developing countries and wealthy ones, there is a pronounced gap between a belief in the equality of the sexes and how that translates into reality. In nations where equal rights are already mandated, women seem stymied by a lack of real progress, the poll found. Several quotes in The New York Times article, by female professors, especially resonated with me. Professor Herminia Ibarra, who teaches organizational behavior at INSEAD, the international business school based in Fontainebleau, France, is quoted as saying: There are still very few women running large organizations, and business culture remains resolutely a boys’ club. And a quote by Professor Jacqui True, who teaches at the University of Auckland in New Zealand, stated: When you’re left out of the club, you know it. When you’re in the club, you don’t see what the problem is. Clearly, women, as professionals, may belong to several "clubs," in which they can be valued members (or not) -- from their immediate departments in their academic or employer organizations to different professional organizations or societies and communities. What is essential is that professionals understand and take part in activities of organizations that are broader in scope than simply their local ones. In this sense, they can obtain not only sustenance in being part of larger communities but they can also engage in life long learning opportunities and build relationships that they can rely upon when the "going gets tough." Women's professional voices are being increasingly heard -- through podcasts and even through blogs and social networking sites. I would like to single out, as an example, the learning resources of INFORMS, one of the professional societies that I belong to, which through the extraordinary efforts of Barry List, has put together a series of podcasts of wide interest and relevance. You will see that several podcasts are interviews with female experts. If you would like to see the full list in digital format, just click here. Students and future generations need to see many different role models in terms of gender and race since the myriad problems that the world is facing from the environment to inequality to wars and strife cannot be addressed through the eye of a needle.